This is my little corner of the web, where I post my stories, some of my sim creations and occasional other musings. I currently have a couple of shorter stories on here, which I hope you'll enjoy reading. I'm currently writing a new story based in Starlight Shores. Perchance to Dream follows the lives of twins Kitty and Steven Laine, as they start a fresh life in a new town, away from their tragic past. As of yet I'm not sure where this story is going, for how long it will last and for how many generations. So enjoy the ride with me - it may surprise us both! Now I wouldn't be doing this if it wasn't for all my friends in the Sims3.com community. 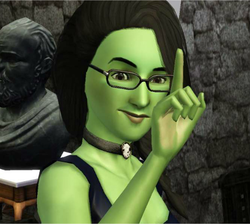 Through their encouragement, kindness and generosity, not only do I have the confidence to try my hand at creative writing, but I have an amazing supply of Sims3 store content at my disposal for storytelling and recolouring fun! I have a thank you thread on the sims3.com site which gives them all a much deserved shoutout. Finally I hope soon to populate the Sim Links section of this site, not just with links to forums, news sites etc, but links to my friends' showcase threads, their new stories and community magazines, all of which show off the immense talent in the Sims 3 community.